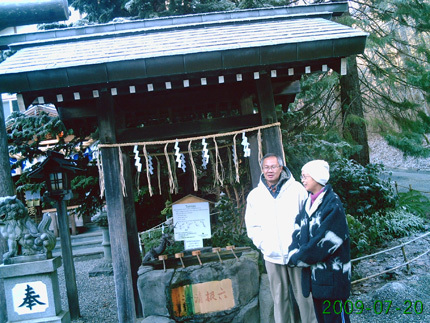 Despite what the dates on the photos may say, this shrine visit occurred on December 26. Is that some morning mist? 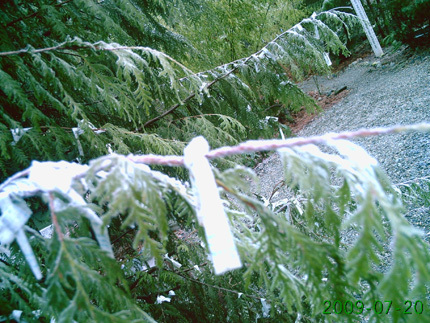 On the morning of December 26, my parents and I were on the bus from Everett to Granite Falls, making a pilgrimage to the Tsubaki Shrine. It was the final leg of a two-hour commute. I’d never been to a Shinto shrine before, although my father, who had worked in Japan several times, had visited shrines in Kyoto. The bus driver had no idea what this shrine thing was we were talking about, but we had the intersection and stop number, and that was good enough. 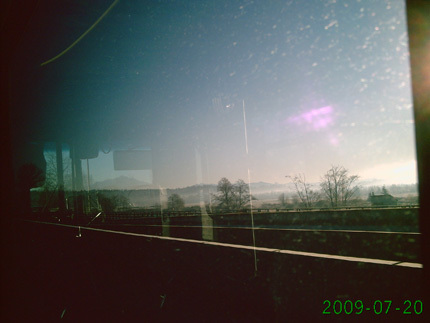 The bus stop, at the corner of Crooked Mile Road, was in the middle of nowhere. 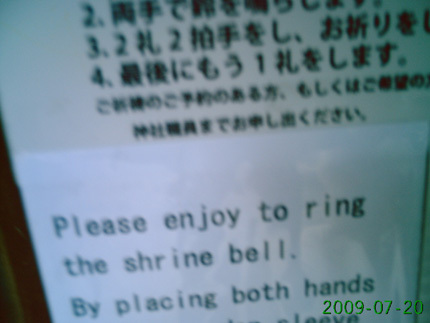 There were no signs saying “Shrine this way”, and we just had to trust in the address and walk. Later, 0.4 miles down the frosty road, we learned that the directions were correct after all. 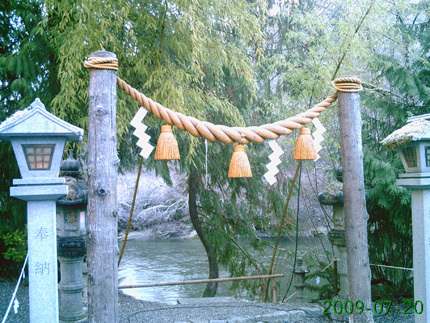 The entrance to the shrine, with the torii. 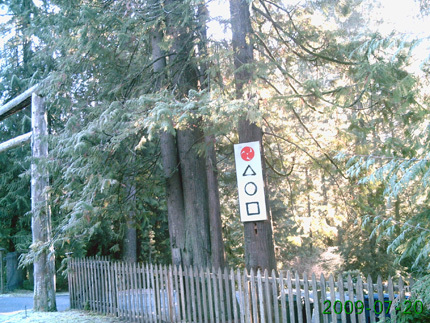 In this context, the triangle, circle, and square symbolize the principles of Aikido, a martial art that is taught at the shrine. 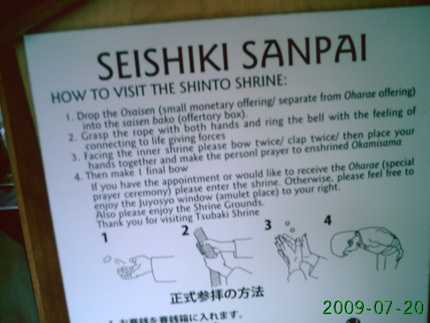 Just inside the torii is this sign. 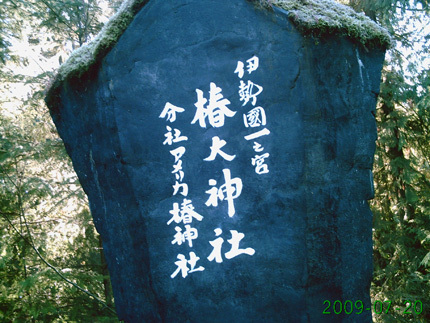 I can’t read all of it, but 椿大神社 is Tsubaki (camellia) Grand Shrine (Tsubaki Okami Yashiro). Being a “grand shrine”, the shrine grounds cover 25 acres, but the actual central shrine is smaller than you might expect. 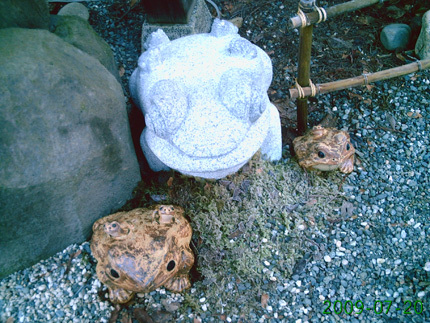 My first impressions were “Why is it so cold?” and “What’s with all the frogs?” I estimate about a dozen frog statues, not counting the smaller frogs that were riding on the back of the bigger statues. One of the gods enshrined at Tsubaki is the America Kokudo Kunitama-no-Kami, the Shinto patron of the North American continent. 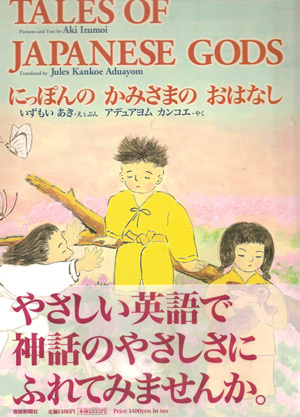 Shinto teaches that there’s a god for everything, so why not? 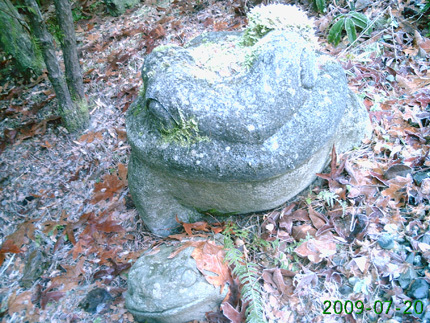 What would a Western kami aligned with frogs look like? 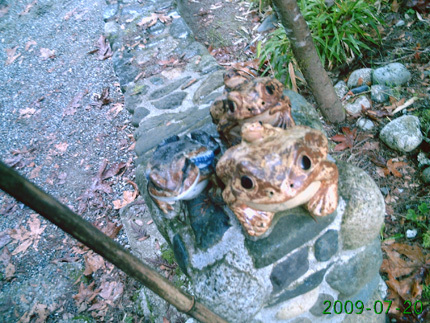 As the attendant priestess explained to us later, the Japanese word for frog (蛙, read かえる or “kaeru”), is also the word for returning/going back, (帰る, also read かえる or “kaeru”). 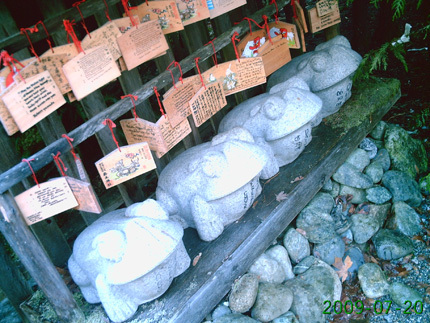 So the frogs are a symbol of the need to return to the holy place. The etymology of the word “religion” is “going through again”, after all. 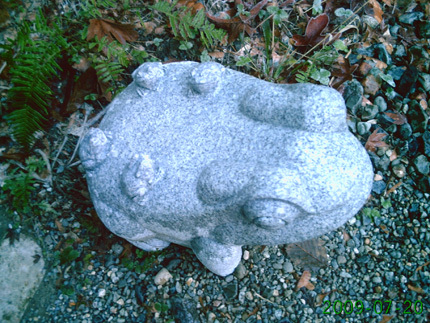 Even in your fountain, frogs. 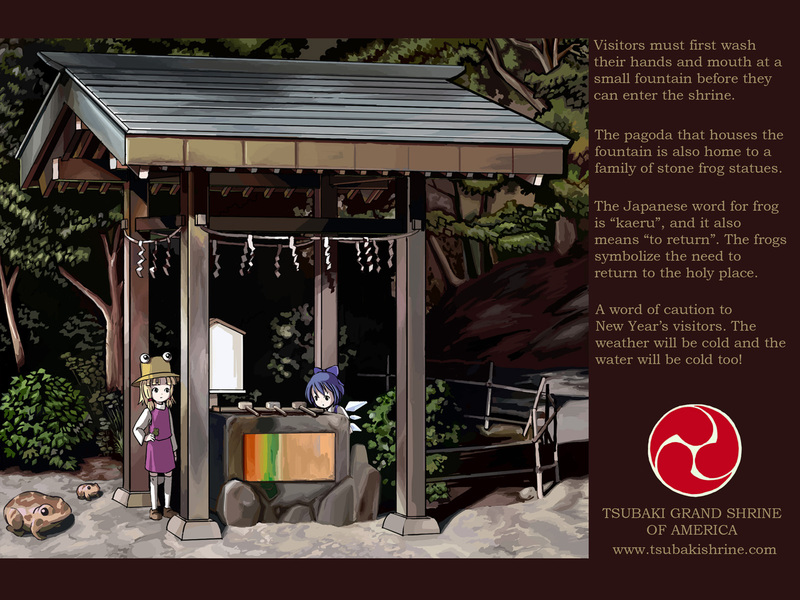 Before we could enter the shrine proper, we had to wash our hands and mouth at a small fountain. The water was extremely cold. Could this just be due to it being winter, or are fairies somehow involved? And let’s stay far away from that river shall we? If you carve a statue out of the wood of the sacred tree, would you get your very own Suwako, Kannagi-style? 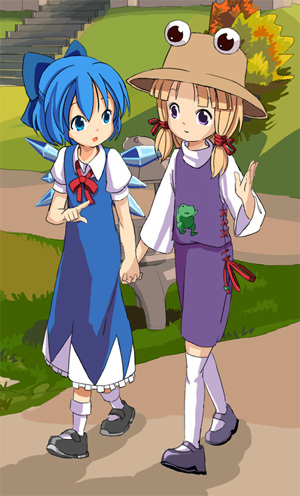 Can’t have Suwako without Kanako. 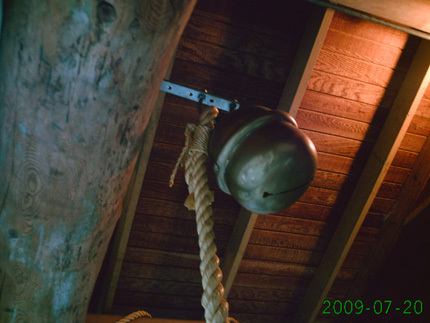 Don’t the lyrics of the above song say “Put the money in and ring the bell”? Well, let’s enjoy. The priest told us to not pull the rope, but just shake it side to side. And yes, we made a donation. The emaden is where you hang wooden plaques with requests and messages of thanksgiving. 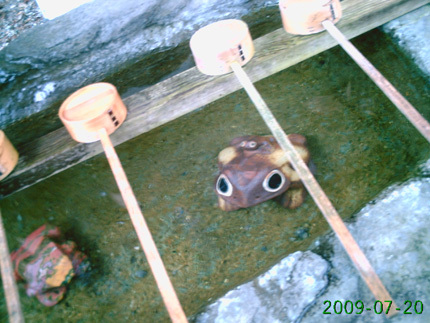 Even in your emaden, frogs. 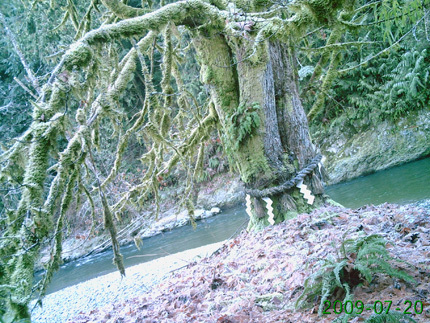 If you draw a bad fortune, you can tie it to a tree to break the curse. We didn’t draw any fortunes though. Just like all religions want your donations, all religions also pray for world peace. We got to meet the Kannushi (shrine priest), Rev. Robert Barrish, the first non-Japanese Shinto priest in history. As you would expect, he is fluent in Japanese. 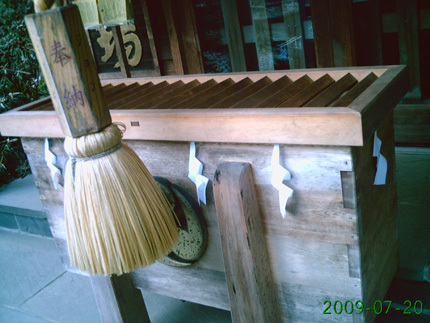 The Japanese priestess at the shrine, Chika, is his wife. They were impressed that we had taken the bus all the way out there. We got a calendar of the year events, including Setsubun, the seasons changing festival that includes Mamemaki (where you throw soybeans at oni to drive them away) and Misogi Shuho (where you purify yourself in the river, which is probably deathly cold, fed by melting snow from the mountains in March). Next was a trip to the shrine store, where I got a copy of this book, that had a few stories that reveal the Shinto influence on the Toho universe and other anime and game-related properties. For example, one of them mentioned the white rabbit of Inaba, who was punished for her pranks by getting her fur pulled out. 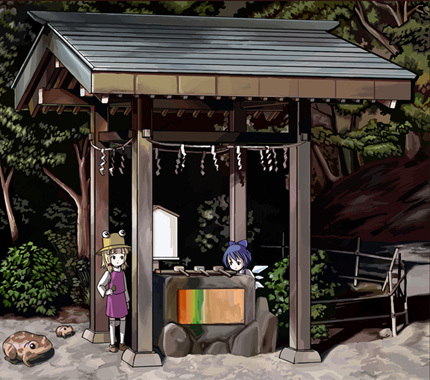 Unlike Yuuto’s amulet in Omamori Himari, which lasted until his 16th birthday before being replaced by a samurai catgirl, this omamori only lasts a year, after which people stack them in a pile and burn them, then buy new ones for the next year. 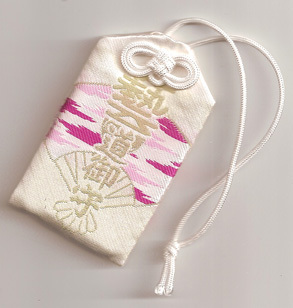 I also got an artist’s amulet (芸能御守, “geinou omamori”). Will it really protect my art skills from declining during the years that I have to go back to school? Who knows? I’ll wear it on my person and say a prayer with it twice a day, but I’ll also schedule weekly drawing practice time. The gods help those who help themselves, after all. All together we spent a little over $40 in donations and merchandise. The bus driver that took us to Everett gave us a little more time than we expected on our transfer ticket, so we didn’t have to pay to get on the bus back home. Rev. Barrish invited us back for New Year, which is a big festival in the Shinto calendar. Minimum donation: $7, but you get tea and mochi and get to participate in the ceremony. My parents have headed back to Chicago, but I’m going back there on Saturday the second (the celebrations are January 1-3.) I’m targeting the 11:30 AM ceremony. I wonder if I’ll meet anyone I know? Now for the commemorative illustration. This entry was posted on Thursday, December 31st, 2009 at 8:42 am	and is filed under Toho. You can follow any responses to this entry through the RSS 2.0 feed. You can skip to the end and leave a response. Pinging is currently not allowed. Thanks for the report with lovely photos and illustrations – I had no idea that there was a Shinto god for the North American continent! When they said that Shinto had eight million million gods I just assumed it was for the Japanese islands only. 8 000 000 000 000 / 125 000 000 = 64 000 gods per one citizen. Seems like every of them has to wear 16-bit mark number, ha-ha. I. Great photos. I would like to know if you may gave me permision to use one of your photos? 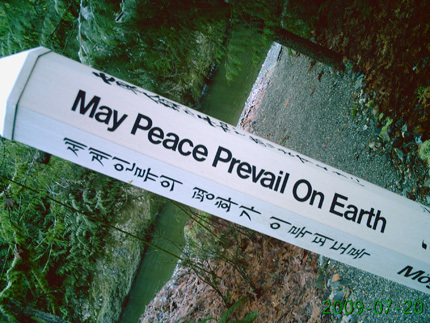 I’m refering to the “May peace prevail on earth” photo. @David: Sure, go ahead and use the photo. Thanks for asking, and sorry for the late reply.